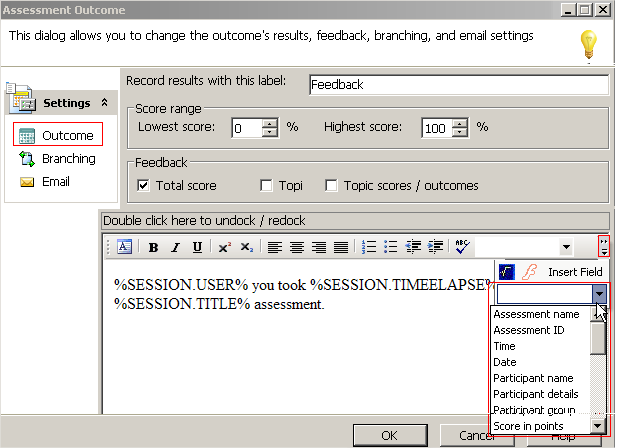 Sometimes you may want participants to receive customized messages when they have taken an assessment — perhaps information about their score or confirmation that they have completed your quiz or test at a particular time and date..
You can do this in Questionmark Perception by adding ” to your assessment outcomes within Perception Authoring Manager. Server variables are ‘merge fields’ that pull data from your Perception repository. 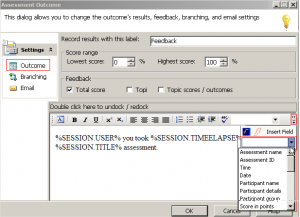 In editing an assessment, you can designate the fields from which you want to draw information for your personalized messages. So each participant, on completing an assessment, will automatically get feedback containing the information you want them to receive.